More than 76 percent of Arizona voters in a recent poll support increased funding for Arizona public schools, but which state legislators do? 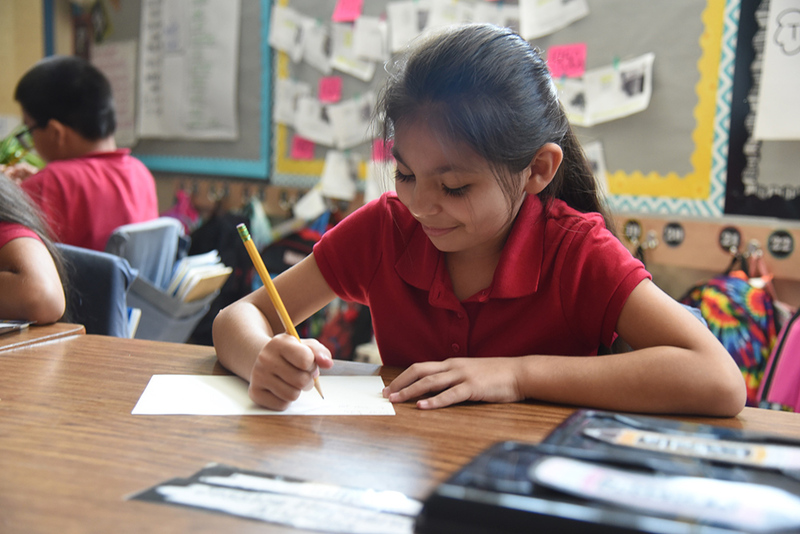 Education and children’s organizations have created resources that show how state legislators’ voted on issues that impact Arizona’s public schools to help voters with their decisions in the Aug. 30 primary and Nov. 8 general election. In addition to funding, the informational materials cover policy issues like legislators support for or opposition to school vouchers. The eight-page report examined how state lawmakers’ votes on tax policy and education funding legislation has affected appropriations for public schools. AZ Schools Now! is made up of volunteers, teachers, parents, school board members, education leaders and advocates focused on the next steps to reinvest in public schools. 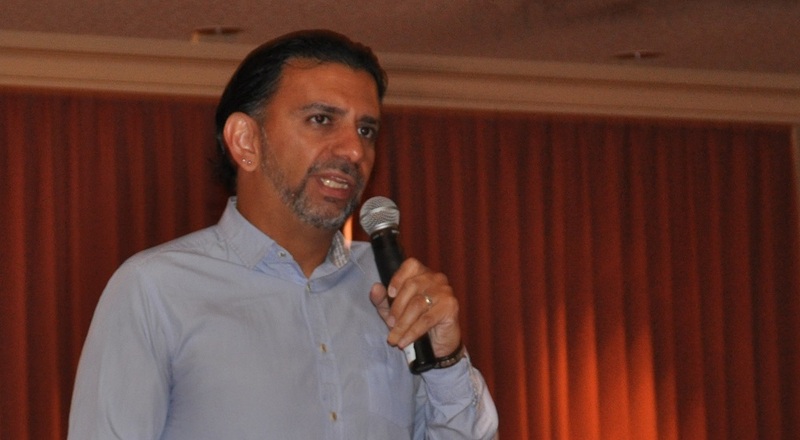 Partners include the Arizona Parent Teacher Association, Support Our Schools Arizona, Arizona Education Association, Arizona School Administrators, Arizona School Boards Association, Children’s Action Alliance and 2016 Arizona Teacher of the Year Christine Marsh. The AZ Schools Now! 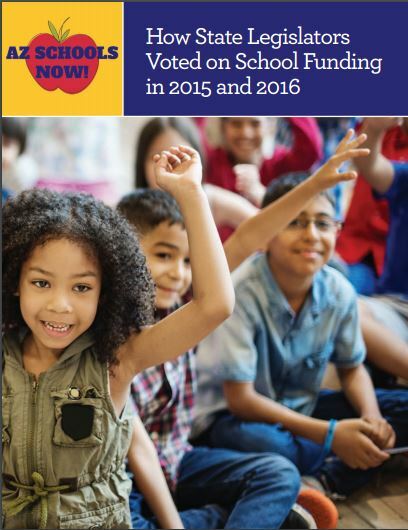 report covers votes in 2015 on K-12 education budget cuts, expansion of corporate private school tax credits, business tax cuts and expansion of private school vouchers (ESAs). The 2016 record of votes includes measures on restoring JTED funding, restoration of restored $116 million in cuts in classroom supplies, textbooks and technology, expansion of private school vouchers (ESAs) and a sales tax exemption for manufacturing/smelting businesses. AZ Schools Now! works to encourage legislators to provide teachers with competitive compensation and professional support, classroom tools and supplies, updated textbooks and technology as well as repair and maintain school facilities for safe, clean places for students to learn. 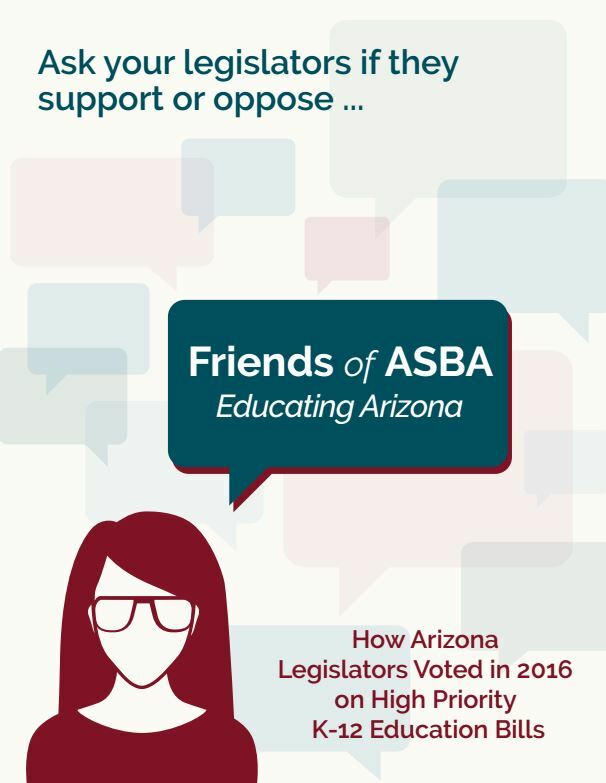 Another report voters can use as a resource is “How Arizona Legislators Voted in 2016 on High Priority K-12 Education Bills” published this month by the Friends of ASBA. The organization, which is affiliated with the non-partisan Arizona School Boards Association, provides access to information and resources on high-priority, high-impact, policy issues related to the educational success of public school students in Arizona. The report, organized by Arizona’s 30 legislative districts, tracks state legislators’ votes on funding, vouchers and local control. It also includes voter turnout, registered voters by party, race/ethnicity of population and children, school districts represented and the number of children living in poverty for every legislative district. Who is running in your district? 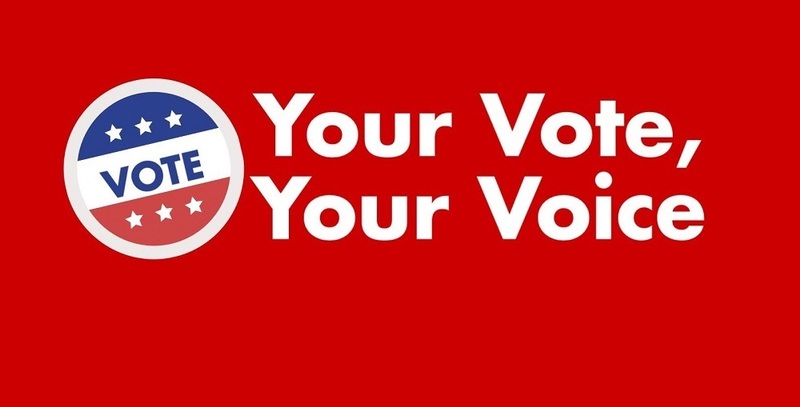 Expect More Arizona’s Vote 4 Education website enables voters to determine their legislative district and who is running by inputting their address and ZIP code. The site will also display who currently is in office. 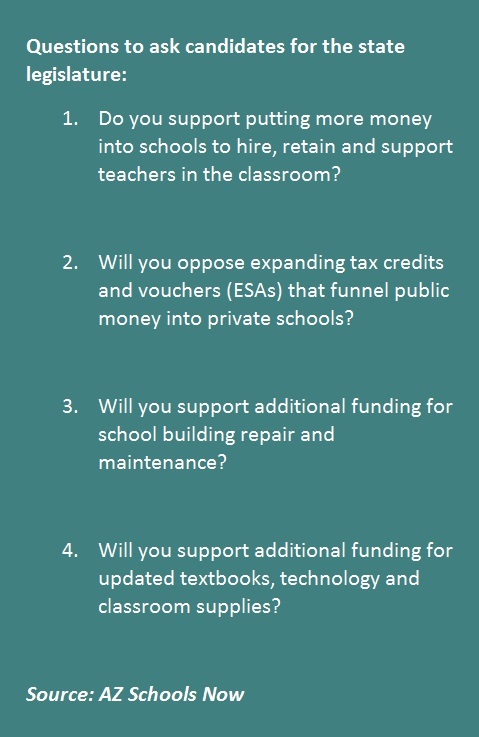 The site includes key questions to ask elected leaders and candidates, information on bonds and overrides, an Arizona Education Progress meter, a voter toolkit as well as strategies to achieve a world-class education. Interested in other issues that affect kids? 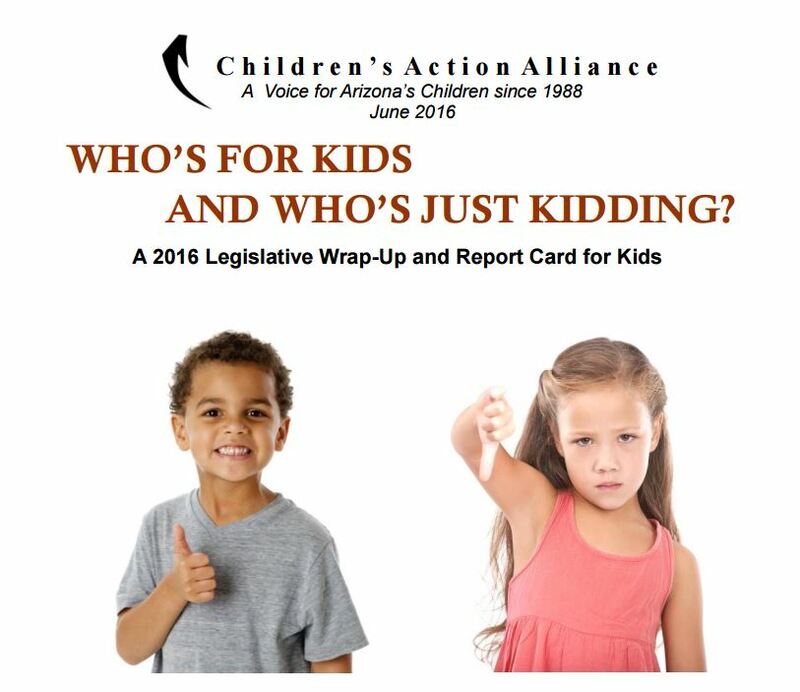 In June, the Children’s Action Alliance released “Who’s For Kids and Who’s Just Kidding: A 2016 Legislative Wrap-Up and Report Card for Kids” which details how Arizona legislators voted on key children’s issues such as KidsCare’s affordable health coverage, income tax cuts, TANF assistance, childcare assistance, juvenile detention, and predatory consumer loans. Nearly two-thirds of voters in a recent national poll said the next president and Congress should invest more in in education, health and nutrition programs that benefit kids, and that interest crosses party lines, said Children’s Action Alliance. Since Arizona legislators are key state policymakers, Children’s Action Alliance posted candidates’ responses to several questions about those areas to help voters make an informed choice.